You need to make money, but you don’t want to be bored doing it. 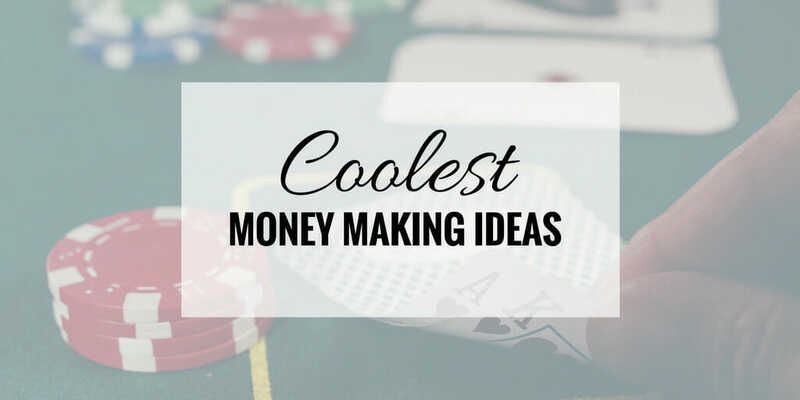 Below is a list of the 25 coolest ways to make money. We have ideas that work for any personality. History is full of many success stories of individuals with an enterprising spirit, a dream to break free from the corporate cycle, and the courage to pursue their own vision. In fact, chances are good that your employer started as an entrepreneur’s dream. If not, it might have started as a family’s line of business that grew and became profitable. Whether you are looking for more sources of income, or you are in the market for full-time employment, there are plenty of money making ideas you can glean your own ideas from or get inspiration for an enterprise or home-based business of your own. The Internet has opened new opportunities for freelancing and stay-at-home business ideas. The new economy is information-driven and you will make money by being resourceful, patient, creative, and aware of the latest trends and demands. For most, winning at poker is pure luck, but few can argue that the top poker players have skill. Expert poker players earn millions each year, but plenty more poker players earn a comfortable living without making millions. Poker is legal in a few places, but before you dive in, make sure you have the stomach for it. Yes, this is a thing. Thanks to Twitch, you can now make a living by live streaming your video game play to the world. It’s been hugely popular for others to post their recorded game play with commentary to YouTube. If a game allows transactions such as trading, then chances are you can earn money. Whether you sell cards for a card game like Magic the Gathering or sell rare items for World of Warcraft, people are making money. In fact, there’s the famous story of a Chinese prison that had inmates mining gold in World of Warcraft so they could sell it. The internet is incomplete without YouTube. YouTube needs stars and with good content and personality you can make your living on YouTube. Google even started a subscription program to remove ads called YouTube Red which pays creators a part of the monthly revenue. What skills or specialties are you knowledgeable of and believe you can teach? People want to learn online. Find a niche where you are an expert, and demand is high, then create a course for it. Are you fluent in a second or third language? Online classes can be done via webcam, or video tutorials. Using Paid Memberships Pro, a free plug-in, and a course management plug-in like WP Courseware (affiliate), you can set up an online course that accepts payments easily. Maybe video isn’t your thing. Then PodCasting is perfect for you. It’s an audio format like Radio, but in an on-demand style. You record interesting audio shows, upload them to a PodCasting service (such as iTunes) that people subscribe to and they listen when they want. The more listeners, the more advertising revenue you can make. You can host your Podcast on your own using a web host such as BlueHost (affiliate). Virtual assistants are one of the fastest-growing segments of home-based online enterprises. Companies want to cut costs by outsourcing much of the back office tasks and activities that can be done remotely. Those with prior experience in office administration work or secretarial tasks have an edge because they know the needed skills. Phone Apps have changed the way we use phones forever. Many successful people today are successful because of their development of phone apps. People include Evan Spiegel (Snapchat), Kevin Systrom (Instagram) and Mikael Hed (Angry Birds). You can achieve this success if your product, target audience and marketing are right. Remember, plenty more developers make a comfortable living who haven’t achieved worldwide fame. You read that correctly. Hackers have gotten a negative reputation over the years, but hackers now make a sweet (and legitimate) income. Companies and governments must learn what their vulnerabilities are, so they hire hackers. Hacking was considered a juvenile, vandal’s past-time but is now a needed service. Enjoy the irony. You understand computers, internet or other applications of technology. People and businesses need your skills. Position yourself as a consultant, build a portfolio and market your services. Years ago, graffiti was only a crime. It was unappreciated vandalism. Today, graffiti is considered artwork and people want to pay you for your work. One of the most famous examples of the success of street art is Banksy. One of his works has even sold over $1,000,000. Many businesses hire graffiti artists to create the right ambiance inside of their business. People love fishing, but many only watch. Many aspiring fishermen want to learn but are unsure where to start. Take aspiring fishermen out on the water for fish, fun and sun. Operating a fishing charter is a cool way to make money and teach others your passion. You can design greeting cards for Christmas, birthdays, graduations, and other important occasions, and offer personalized designs or messages. Mailed-out greeting cards are still around, but consider making this an online enterprise as well; many people prefer e-greeting cards. Mixed martial arts are at their peak of popularity. Aspiring martial artists want to learn what they’ve seen in TV and movies. There are also plenty who just want to learn how to defend themselves or their family. Whether you want to train the next Gracie, or teach a group of mothers how to defend against an attacker, you can earn a great income. The best part of this idea is that you are helping people learn to defend themselves. Do you love creepy stuff? Do you love freaking other people out? If you live near the right city, then ghost tours might be perfect for you. Learn your city’s history, get permission to tour the most exciting locations and have a ghoulish time. If you know your food, flavors and science then molecular gastronomy is a hit right now. There are few other areas of culinary creation where you can test out things like pine flavored foams. Food trucks have become popular over the last few years and the characters that run them have even landed TV show deals. Food trucks are the perfect fusion of food and personality. As people become more aware (and concerned) with what is in their food and drinks, they want beveerages made with wholesome ingredients they can pronounce. A huge and growing market for crafted sodas and beers has emerged with the “buy local” movement and you can capitalize on it. What was once a simple, smooth pepper puree has since cultivated a nearly wine-like complexity to it. Hot sauces today aren’t what your grandmother called hot sauces. From exotic ingredients and complex flavor profiles to exploring the extremes of Scoville units. If you love hot sauces, then it might be time for you to bring the heat. By teaching local classes or even creating an online course, you can help people understand food and food preparation. The more specific, the better. For example, if you know how to ferment foods, or how to smoke food, you’ve got an audience waiting for you. I love this idea because you take a passion and make it into a kit so beginners can learn the ropes. Years ago, if you wanted to learn brewing, you had to talk to people. Now you can buy a beer brewing kit in Kohl’s and WalMart. Any hobby, job or interest can be summarized into a simplified kit. Even mushroom farming. Summarize the absolute necessities, put it into a kit with instructions and make it happen. You love music and you love giving people a good time. DJing is a gratifying way to earn money. Whether you work the party circuit or the wedding circuit, you can make a name and money. Test your own music’s popularity with service like SoundCloud. Tons of homes are on the market. Home staging, or the practice of preparing a home using interior decorating principles for selling success, is a low-cost start-up opportunity for those with an eye for detail and love for home decoration. While not the traditional meaning of cool, this idea is great because of what the job affords. Technology has allowed medical billing and transcription job to be managed and performed remotely. If you have experience in this segment of the health care industry, you can set up a home-based medical billing and transcription service and network with physicians or even established health care firms. Companies are looking for mystery shoppers who visit different establishments as regular customers, such as restaurants, stores, or their competitors, and then give feedback and reviews of the establishments they visited. You are paid to be a customer and give a report on your experience. You get to enjoy many freebies and privileges as well. Do you want more cool money-making ideas? Check out our Money Making Ideas Guide.